Dr. Vineet Kapoor belongs to the younger generation of doctors amongst his peers. But as an expert in Dental Implantology, it should suffice to say that he already has made a significant mark in his 10 years of career. He practices at the Cures 'n' Care Dental Clinic located at Ghaziabad. He has been awarded and recognised as "BEST DENTAL SURGEON & iMPLANTOLOGIST IN DELHI NCR" for the year 2018 at INDIA'S MOST TRUSTED HEALTHCARE AWARDS 2018. His driving passion as well as the specialized area in which his skills lie is implant dentistry. His alma mater happens to be Amrita School of Dentistry and has contributed really a lot to bring back many a winning smiles which have won him both admiration as well as love. Dr. Vineet Kapoor is keenly considerate of the anxieties that lie at the back of the mind of a patient while visiting a doctor. He responds to this by using innovative and soothing techniques which make the patient feel more relaxed and at ease. As a matter of fact, his objective is to provide his patients with only the most effective and safest treatments while keeping their comforts a top priority. 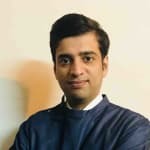 Dr. Kapoor completed his BDS in the year 2008 from Amrita School of Dentistry, Kerala after which he opted for further training as certificate courses on Dental Oral Implantology from AIC (Osstem). He also has a certification on ClearPath Orthodontic Aligners, New Delhi. Dr. Kapoor is an active member of the dentistry community and is a member of the Royal Society of Public Health, London in addition to being a member of the Indian Dental Association. Dr. Vineet know his subject very well :). he is one of the best Dental surgeon I have seen so far with calm and balanced approach to achieve perfect dental health. My entire family is benefited with his treatment and advise, I strongly recommend Dr. Vineet for all your dental queries. Wish you all the best Vineet and thanks again for all your help. I have always been scared of Dental Surgeons. But Dr. Vineet's calm and warm nature faded my fear. Pleased to have found a good Dentist !! I had a very good experience, Dr Vineet's expertise helped me relieve my teeth trouble. Hygienic and supportive staff. As per dentist advice, I go for implant for 01 upper front teeth. Before starting doctor taken the whole teeth structure pic and so many required blood test. On giving me assurance, he started the implant procedure, firstly he removed the teeth which was damaged. After going through surgery treatment he asked in the mean time that he cleaned the bone but will not fix screw as 50% chances to success and give the 3 suture on cut gum. He said after one month on healing he will fix the screw for implant. On repeated asking that what is the problem he did not said much more and said after one month he will done. Pl anyone help, what could be the problem as after starting the procedure why they left in half end? Have faith in your dentist. Sometimes bone is not ready for immediate implantation of dental implants soon after the extraction. Kindly follow the advice of your dentist. There is no harm in delaying a surgical procedure if your dentist advices. Thank you. A beautiful smile plays a very vital role in enhancing the overall beauty of face. Rotated, stained and maL-placed tooth can cause major aesthetic/cosmetic and psychological problems in teenage and young adults. Mid-line teeth gap, rotated teeth, crowded teeth, stained teeth, broken tooth edges and wearing tooth edges are the most common cosmetic problems that our patients report to us. Dynamic advancements in the field of dentistry has come across with the solution of majority of cosmetic problems. a. Porcelain (indirect) veneers, which must first be created to fit your teeth in a dental laboratory and require two visits to the dentist. Porcelain veneers are generally stronger, while composite veneers are less expensive. With porcelain veneers, the dentist takes an impression of the tooth and sends it to the dental lab for fabrication of the veneer, usually after the front of the tooth has been reduced. b. Composite (direct) veneers, which are bonded to your tooth enamel in a single visit. With either method, the tooth is prepared for bonding by roughening the front surface with mild etching solution. The veneer can then be bonded to your tooth using a dental bonding cement. 2. Bonding: It uses composite resin to restore chipped or broken teeth, fill in gaps and reshape or recolor your smile. After applying a very mild etching solution that slightly roughens the surface of your teeth and permits the bonding material to adhere, your dentist applies the resin and sculpts, colours and shapes it to provide a pleasing result. A high-intensity light hardens the material, which is then finely polished. Bonding agents are used in treatment of midline gap closures, fractured tooth restoration, wearing teeth edges. g. Trauma to the teeth that may result in the death of the tooth's nerve, giving the tooth a brown, grey or black colour. Whitening/Bleaching is a simple procedure where whitening agents are applied over the tooth surface in order to chemically change the colour of tooth. It can either be a single visit clinical procedure or multiple application home procedure under the guidance of your dentist. Will my newly whitened teeth stain? Any tooth can stain, including the veneers and bonds mentioned above. To help prevent stains from coming back, avoid smoking, coffee, tea, red wine and heavily coloured foods. And brush your teeth twice a day with a whitening toothpaste. If you wish to discuss about any specific dental problem, you can consult a specilized dentist and ask a free question. Tooth whitening lightens teeth and helps to remove stains and discoloration. Whitening is among the most popular cosmetic dental procedures because it can greatly improve how your teeth look. Most dentists perform tooth whitening. Whitening is not a one time procedure. It will need to be repeated from time to time if you want to maintain the brighter color. The outer layer of the tooth is called the enamel. The color of natural teeth is created by the reflection and scattering of light off the enamel, combined with the color of the dentin under it. Your genes affect the thickness and smoothness of the enamel. Thinner enamel allows more of the color of the dentin to show through. Having smoother or rougher enamel also affects the reflection of light and therefore the color. Aging makes teeth less bright as the enamel gets thinner and the dentin becomes darker. It is also possible to have stains inside the tooth. These are called intrinsic stains. For example, intrinsic stains can be caused by exposure to too much fluoride as a child while teeth are developing. Other causes include tetracycline antibiotics. They can stain a child's teeth if taken by a mother during the second half of pregnancy or by a child who is 8 years old or younger. Teeth are still developing during these years. Trauma can also darken a tooth and tooth whitening is the most effective way to treat on surface (extrinsic) stains. Save a Knocked Out Tooth! More than 5 million teeth are knocked out every year in children and adults. With proper emergency action, a tooth that has been knocked out of its socket can be successfully replanted and last for years. It is important to see a dentist as soon as possible after the tooth is knocked out. Quick action will increase the likelihood of saving the tooth. Locate the tooth immediately; do not leave it at the site of the accident. The tooth should be handled carefully touch only the crown to minimize injury to the root. Regular tap water is not recommended for long term storage because the root surface cells do not tolerate water for long periods of time. Bring the tooth to a dentist as soon as possible, ideally, within 30 minutes. However, it is possible to save the tooth even if it has been outside the mouth for an hour or more. Since couple of weeks, I am having this tingling in my teeth whenever I eat something sweet or sugary. I think it may be the signs of sensitivity. I brush my teeth daily in the morning. Please tell me how I can do to cure it and prevent further pain. Hello, you may be having a carious (rotten) teeth. Brush twice daily, use mouthwash once daily, floss every 2nd-3rd day and visit a nearest dentist. Thank you. Mouthwashes can be classified as cosmetic and therapeutic. Rinsing with cosmetic mouthwash will loosen bits of food from your teeth, lessen bacteria in mouth, temporarily reduce bad breath and leave a refreshing taste in your mouth. These products can't make a greater claim than that. Therapeutic mouthwashes contains active ingredients like chlorhexidine, fluorides, cetylperidinium etc, which have proven active against fighting plaque and bacteria (s) in mouth for longer duration. Many mouthwashes contains high amount of alcohol which may cause dry mouth and ironically in turn causing bad breath. Alcohol free mouthwashes are also available. Active ingredients like chlorhexidine causes temproary altered taste in mouth and is not recommended to be used for longer duration. Mouthwashes temporarily curtains bad breath. Causes of bad breath are variable and should be accessed before unjustified use of mouthwashes. Mouthwash acts as an add-on, not replacement for brushing and flossing. Use of mouthwash in conjunction with brushing and flossing will improve overall personal oral hygiene. Generally we swish mouthwash in a few seconds because of its bitter taste or lack of knowledge. Mouthwash should be diluted as per the instructions given by the manufacturer and should be swished vigorously for 30 seconds. Flossing is as important as brushing on a daily basis. Taking the floss all the way down to the point where the teeth and gums meet is the appropriate way of doing it. Gingivitis is a mild form of gum disease which occurs because of the inflammation of the gums. It can easily be reversed with daily brushing and flossing and getting dental cleaning done regularly. Hi, I am 34 years old male and having gaps in 4 upper front teeth. I visited one dentist in Agra, he is periodontics by professions and he advised me for braces and veneers cost 40-50k, that is too high but they not suggested composite bonding or any cost effective method. Please help me what is should do.